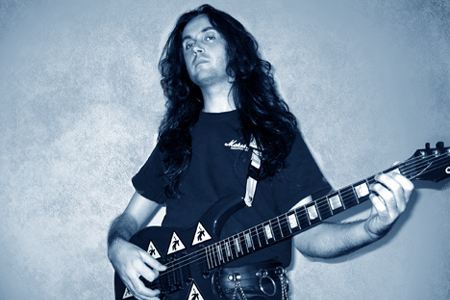 Perhaps better known as the keyboard and musical mastermind behind Twinspirits, Genius Rock Opera, Cosmics and Khymera; the multi-talented Daniele Liverani is also a guitarist of considerable skill as his new instrumental album "Eleven Mysteries" testifies on 20 July 2012. While “Eleven Mysteries” is basically a guitar oriented album, the overall vibe of all the songs is definitely more like a “Conceptual instrumental album” where guitar has the role of a “virtual singer”. Musically there's some intense shred, but also some very melodic moments, and the musicianship and arrangements of the talented line up involved helped to create a wide variety of atmospheres and different musical moments; due to the skills and different influences of the various musicians. However, this not only an album for guitar lovers, but for anyone that appreciates musical composition on a more general level with lots to discover in and each and every track along with a first class production. On the diverse nature of material Daniele says, “I think there's a very cinematic feel in the packaging of these 11 songs. The listening experience is really very close to a visual experience due to lots of ambient sounds, processed samples and speeches’ included in songs key spots. Also after many years I got back to guitar in a serious way, and practised a lot, experimented on sounds etc like I probably never did before, and I think this can be heard in the production of the album, I dedicated a lot of time to this aspect”. Whilst the guitar work is undoubtedly the lead instrument, there is also an excellent backing from three new musicians that Liverani has discovered in the last few years and welcomes drummer Paco Barilla’, bassist Tony Dickinson and keyboardist Marco Zago to the scene. On his new musical partners Liverani proudly states: “These 3 gifted musicians I discovered have given a fresh feel to this album and I'm very happy about the result”. Discussing his new release Daniele Liverani comments: “My personal goal was to give a voice to my guitar playing and try to express and communicate on a musical level (with no lyrics) some emotional concepts that I was interested lately, about life issues, afterlife, philosophy and human interactions. The whole musical journey of the album runs through some basics of human life and spirituality, in particular 3 aspects which are interaction of Body, Spirit & Personality and their involvement in life's events. Basically it's a guitar oriented instrumental album, but there's plenty of phrases added here and there, processed in an artistic way. There are some lyrics in the album on a spoken/efx form that can lead the listener through all the listening and emotional process. Lately, I read a lot of Philosophical books, historical events books and did a lot of research about different cultures regarding common aspects like life, death, after death, and different ways of thinking. I tried then to sum up all concepts that caught my attention and tried to synthesize them in some key phrases and developed music that could describe the feel of each conceptual issue. I would like to point out that all songs were written by me, except song “Giving” that was written by talented keyboard player Marco Zago. I always wrote all music in my solo albums in the past, but this musician wrote and offered me a great track that turned out to be perfect for a specific chapter of this concept, and I was very happy to let him contribute with that song for this album”. 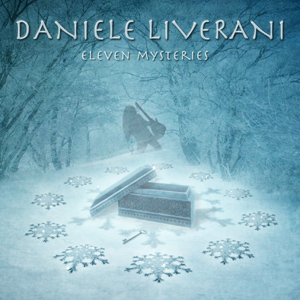 Daniele Liverani – Eleven Mysteries is released in July 2012 on Lion Music.